You may be familiar with a few of the over 600 public playgrounds in metro Denver, but do you know where to go for some serious sliding action? Playground slides are everywhere – 95% of play areas have them. Here I’m taking a closer look at 14 parks with the best sliding equipment in greater Denver. 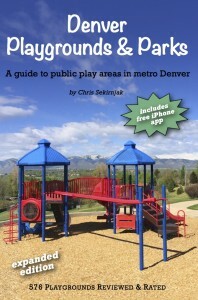 Get additional ideas in my guide “Denver Playgrounds & Park,” available in book and iPhone app format. The book is sold at local stores such as The Bookies, Timbuk Toys, and The Tattered Cover. For details, visit my website playgroundsdenver.com. 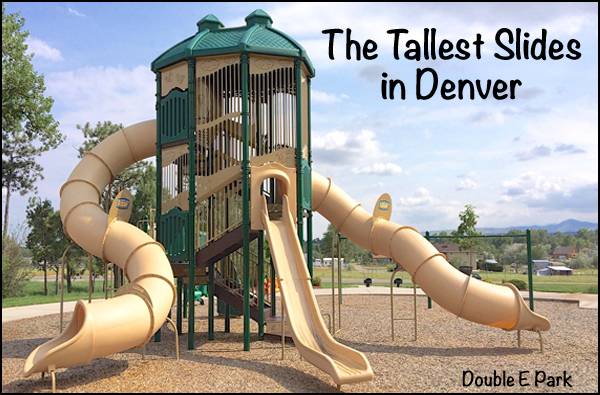 Also, don’t miss my previous blog post 5 Amazing Denver Playgrounds You Didn’t Know About. The steepest and tallest slides are found at the top of multilevel play towers, typically at newer playgrounds built over the past few years. You’ll have to climb 4-6 short flights of stairs to get up there! Several long tunnel slides wind their way down. My 3 favorite (and the tallest) such towers are located at East Elementary Park (Littleton), Memorial Park (Arvada), and Estates Park (Golden). Hold on to your hats – it’s windy up there! 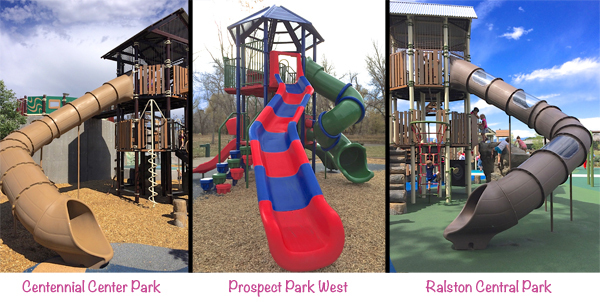 Parks such as Centennial Center Park (Centennial), Prospect Park (Wheat Ridge), Ralston Central Park (Arvada), Apple Meadows Park (Golden), and Arvada Volunteer Fire Fighters Park (Arvada) offer both open and enclosed slides, some of them even with windows. These slides are typically not quite as steep. If twisty slides are what you crave, look no further than the examples shown below. While not as tall as the previous slides, these might get you dizzy zooming down two or more full turns! They can be found in parks of variable age all across town, from Golden to Aurora. Guest blogger Chris Sekirnjak has been in the Denver area since 2004 and currently lives in Applewood (Wheat Ridge) with his wife and two young children. Outdoor fun has been his main form of entertainment ever since he was a little boy growing up in Austria. His two guide books Run, Stroll, Hike and Denver Playgrounds & Parks were published in 2014 and recently have been adapted to iPhone apps. I’ll attest to the fun slide at Memorial Park! Me thinks this playground book would be an awesome present for a new mom.